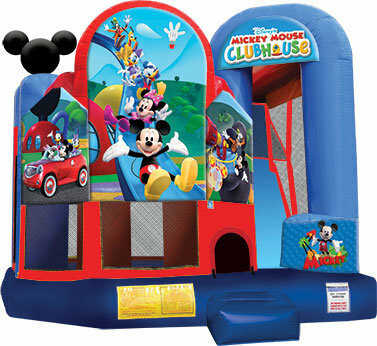 The licensed 15 X 18 Mickey Park Backyard combo bouncy castle will bring the Mickey Mouse Club House to your next event or party! Players of all ages can join, as Mickey and Minnie, Daffy and Daisy and Goofy invite guests to Mickey Park, where children can choose from five different activities in this entertaining bouncy castle. Fantastic artwork shows Mickey and the gang having all kinds of fun: riding down a winding slide and going for a drive. Trademark Mickey ears point the way on top of this Backyard combo bouncy castle, which is part of an entire line of Mickey Park products from Ninja Jump. The Backyard combo style bounce house is the ultimate in inflatable jumpers! The large interior jumping area offers a basketball hoop. This bouncy castle has a climb feature and a convenient exit slide for hours of active fun! Parents and spectators are offered a clear view with the 360-degree mesh sides of this moonwalk. The Backyard combo bounce house is made of lite n strong™ fire-resistant vinyl for safety and durability. This Backyard bouncy house is sure to make any indoor or outdoor event a great success!